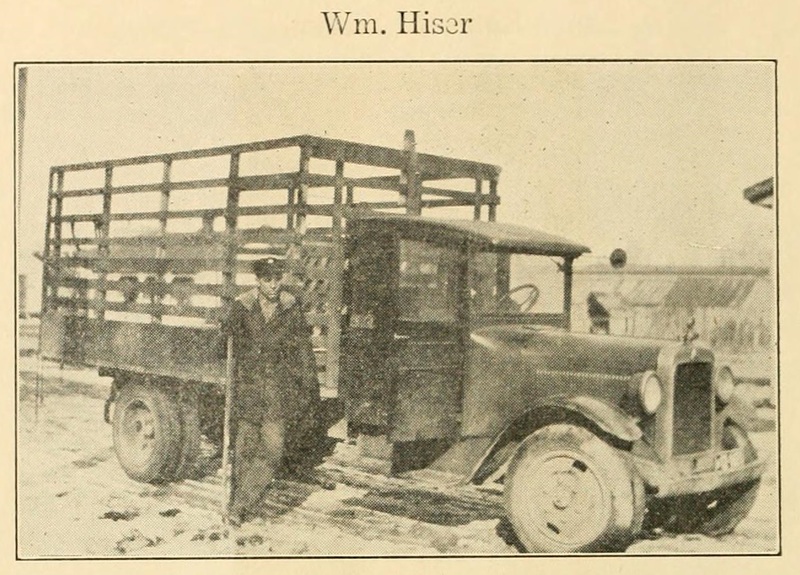 Pictured above is a Dodge dual wheel truck with the owner, Will Hiser, standing at the door. The picture and what has already been said is enough for the truck, so we'll tell you more about "Bill." He was born on a farm about two miles west of Sailor Springs. July 10, 1895. When about eight years old he moved with his parents to Sailor Springs where he continued to live until married, then he moved to a farm between Clay City and the Springs where he lived a year or so, then removed back to the Springs where he engaged in teaming. On Thanksgiving day in 1924, while hunting the accidental discharge of a shotgun while his two hands were resting over the muzzle of the gun, tore away a part of each hand, leaving a thumb and little finger on one hand and three fingers on the other. 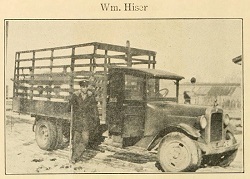 In 1925 he moved to Clay City and engaged in the taxi business, which he followed and at the same time gradually drifted into the trucking business until recently, when he purchased his second truck, the one pictured and now he is applying himself to the trucking business almost exclusively, doing local and long distance hauling, trucking live stock to the market is the principal feature of the business. After moving to Clay City Mr. Hiser bought a home here and has done his part in helping Clay City to grow better by adding improvements about his place. He has prospered in spite of his handicap — he does not seem to recognize the fact that he has but parts of two hands. He has a wife and two children, a son and a daughter and plenty of grit to see that they live comfortably.